It is a term that implies travelling from place to place on foot or by non-mechanised transport such as horse riding, carrying personal equipment in a rucksack or being assisted by porters or sometimes pack animals. 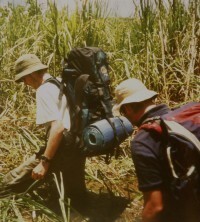 Trekking through a swamp - beware of crocodiles! Often the final daily destination may be uncertain due to terrain, weather difficulties or slower members of the party. Delays may occur due to falls, foot or leg injuries and blisters. Overnight accommodation may be in lodges, tents or the open air. There is little chance of having a warm bedroom or a comfortable bed, and the food is likely to be basic. The trekker must be able and willing to put up with such conditions. Trekking may take place in many different environments ranging from high mountain regions to tropical rainforest. All ages can participate and include the young and those with disabilities - specific health concerns must be taken into account at the planning stage. Clothing should be suitable for all the weather conditions likely to be encountered, ideally layers of clothing rather than thick clothing so items can be added to or removed to adjust to changes in the weather and temperature. A hat is likely to be needed to protect the face from exposure to sunlight and also gloves may be necessary to protect the hands from exposure to cold. Suitable boots or trekking shoes are essential - they must fit well and the leather or other materials be softened to avoid blisters and other foot problems. Sunblock cream must be applied 20 minutes before first exposure and at regular intervals throughout the day. Other items in the trekker’s daypack should include a filter water bottle. Adequate fluid intake is important and high-calorie snacks if there will be long intervals between meals. 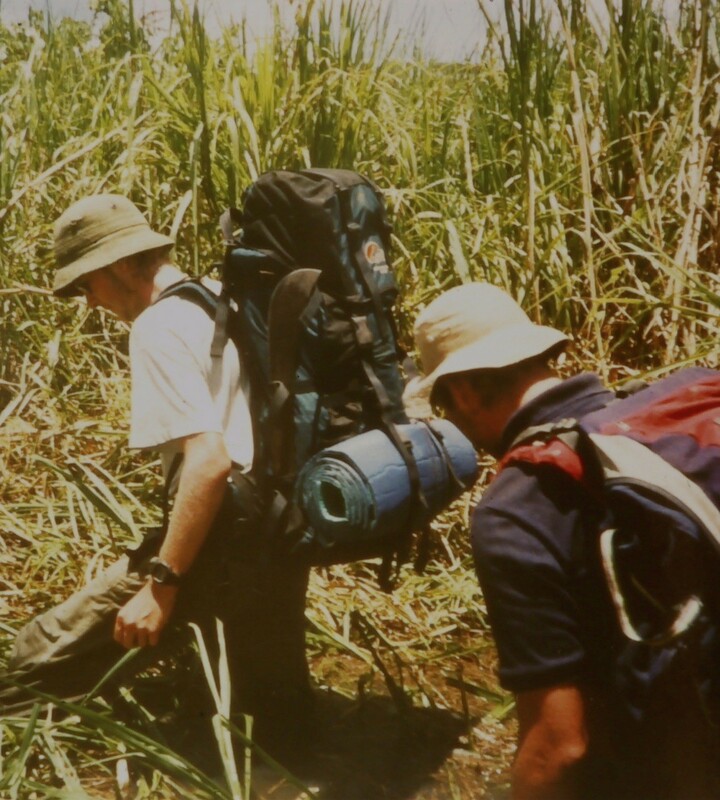 The trekker should have at least a basic level of physical fitness and become accustomed to travelling on foot by training walks before the trek. Depending on the nature of the trek there may be an increased risk of accidents. Horse riding is considered to put the traveller at a similar risk of accidents as skiers by travel insurance companies. Long days travelling on foot can cause muscle and joint discomfort in those not accustomed to exertion and can exacerbate pre-existing medical conditions such as cardiac and respiratory problems, so a medical check before departure is important, especially for older trekkers. Where a trekker becomes ill during the trek, this must be communicated to the trek leader and not concealed in an attempt to avoid ‘holding up the group’. If there is a dedicated camp cook he/she should be, and often is, well trained in food and water hygiene. 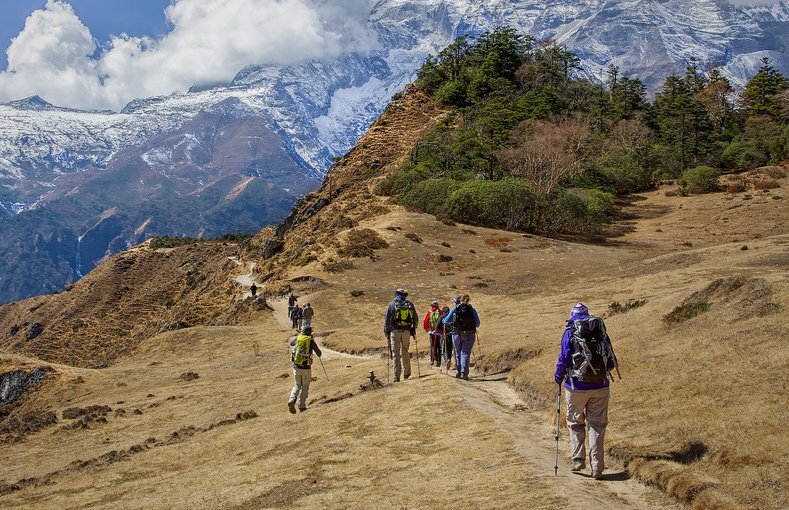 Members of a trekking party may snore at night and earplugs can help companions to sleep more soundly. Trekkers may bring sheets or a sleeping bag liner. Scabies and bed lice are common in lodges and supplied the bed linen may not be adequately laundered. On large and long treks baggage is usually transported by porters or animals, so the trekker only carries what is necessary during the day. For large groups, this may involve the use of many porters as well as local guides and a cook and kitchen staff. Organisations like Tourism Concern promote the welfare of porters and encourage, for example, providing them with appropriate clothing, footwear and night shelters if necessary. However is the responsibility of every trekker who uses a trekking agency or hires porters to ensure that they are properly looked after and adequately insured as should be the trekkers. Some may consider it unethical to hire someone to carry their equipment, but this job is a valuable source of income for many local people.